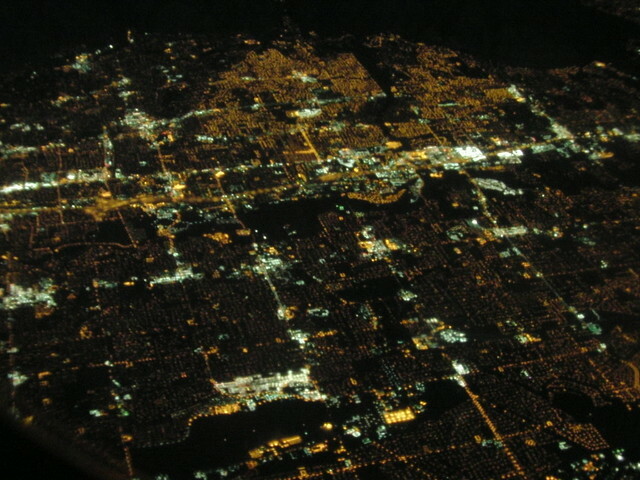 Looking down from thirty thousand feet on the evening flight to LA I watched the lights of a city start to slide beneath the plane, white and gold traced across the Utah desert highlands. Sandwiched between snowy mountains and dark lake it could only be one place, Salt Lake City - or rather that conurbation that runs along the western slopes of the Wasach range, from Salt Lake down to Provo and beyond. The lights of the city were clear in the winter dark, wide ribbons of freeway headlights, the sodium glow of the streets, the green of floodlight parks and sports grounds, and the white bright glows of malls. We leave such a mark on this planet.